With those words, Aimee Bissonette aptly describes the quandary 21st century school administrators find themselves in as they navigate the constantly changing conditions of relationships between technology and schools and those who use it. Often, the technology is changing faster than school leaders can address the issues that the use of that technology by students, staff and teachers brings to the school environment. Twenty-first administrators are constantly looking for resources that offer clear guidance on these complicated issues. 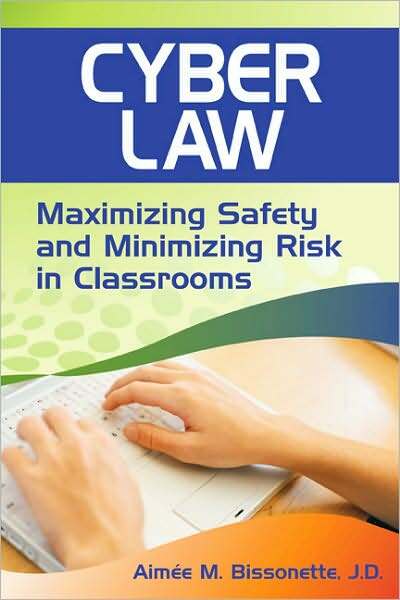 That’s where Bissonette’s book Cyber Law: Maximizing Safety and Minimizing Risk in the Classrooms can help. This book provides readers with lucid, specific advice on how to develop effective technology policy, on what the legal issues are in the development of that policy, and measures schools can take to be proactive in order to avoid the legal minefields and having their schools appear in national headlines. Cyber Law is cover-to-cover advice for school leaders looking to write new technology policy or revise current technology policy, and Bissonette, even though she’s an attorney, uses an engaging, non-technical style. For example, she provides very clear advice on what schools should do when writing cyberbullying policies. She assists school leaders by helping them navigate the thorny issues of First Amendment Rights and free speech when drafting rules and regulations regarding student expression in a technological environment. She also provides clear advice for school policymakers on how to navigate those same free speech issues when it comes to dealing with teacher and staff expression through the Internet. The advice Bissonette gives is clear and comprehensive. Every technology-related legal issue from cyberbullying to copyright law is covered in this book. While Bissonette wisely cautions that her book is not a substitute for legal advice, it does provide a legal overview of the litigation landscape that has an affect on technology policy development. For example, she provides a complete overview of the legal cases that impact decisions on how schools can address cyberbullying. She provides that same overview regarding how school leaders can set policy that guides teacher and staff use of school network systems. She even reviews FERPA and copyright law as it might pertain to technology policy development. Her book is not a substitute for legal advice, but it certainly is a starting point for school leaders to begin discussing what their technology policy looks like and how it might be made more effective. Finally, Cyber Law has specific measures schools should take to protect themselves from litigation interspersed throughout all chapters of the book. Beginning in chapter one, Bissonette gives school leaders advice on what kinds of elements should be included in cyberbullying policies. She provides clear guidelines in chapter two regarding what schools can do to reduce inappropriate behaviors from students as they engage in the use of school technology resources. In chapter three she provides a clear checklist for addressing teacher and staff use of Internet systems in school policy. Throughout the book, Bissonette provides specific ideas on how school leaders can protect their schools and districts from litigation and tragedy. As we continue to wade deeper into the rapids of 21st century education with its changing technologies, we can certainly use all of the advice and guidance we can get. Aimee Bissonette’s book Cyber Law: Maximizing Safety and Minimizing Risk in Classrooms is an excellent resource for 21st century school leaders faced with setting, revising, and enforcing technology policy.